Our team of qualified of bathroom and kitchen fitters will make your bathroom and/or kitchen installation a smooth and well-planned process. We have a vast knowledge of bathroom design, products and installation giving us the ability to provide a service second to none. 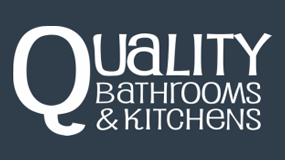 With over 15 years experience, our vast knowledge of new and old systems ensures that Quality Bathrooms & Kitchens are able to work to manufacturers specifications; we regularly fit for leading specialist bathroom and kitchen manufacturers. We can meet all your needs and more on a wide selection of designer bathrooms, suites, bathroom furniture and bathroom accessories. Above all else, Quality Bathrooms offer a cost efficient, professional and efficient service.